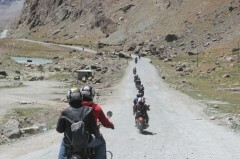 Sign up for this 8-day motorbiking tour of Ladakh and explore the land of high passes with an off-beat itinerary. You'll visit the famed lakes of Pangong and Tso Moriri, travel to the sand dunes of Hunder, ride through the high-altitude pass of Khardung-La, visit the historic monasteries of Thiksey and Diskit, apart from a range of other, exciting adventures. A major highlight of this itinerary, you'll also visit the distant village of Hanle, near the Indo-Tibetan border. Ladakh, the land of high mountain passes, is also the land of extraordinary beauty. The Ladakhi terrain, flanked by the towering mountains of the Trans-Himalayan range, with snow-capped summits rising far beyond the clouds, is home to one of the most iconic motorbiking routes in the country. With scenic views of the landscape, painted in differing shades of grey and brown, you'll explore faraway villages and secluded landmarks in the region on a 8-day motorbiking itinerary. 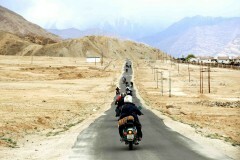 Your adventure begins in Leh, the largest city of Ladakh. After exploring the city, you'll travel to the sand dunes of the Nubra Valley and spend a night by the famous Pangong Lake. A highlight of this itinerary, you'll also visit the distant village of Hanle and the multi-coloured Tso Moriri. You'll travel back to Leh, ending the tour with unforgettable experiences. 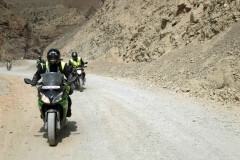 On the last day of your motorbiking adventure, you'll return to Leh from Tso Moriri. 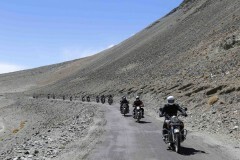 You'll ride through a relatively, less travelled route, with open and vacant areas. Mountains of the Changthang valley will keep you company through until you arrive in Leh. Overnight in a hotel at Leh. Check-out from the hotel and proceed to your next destination. Your trip ends here. Today's meal package includes breakfast only. Your trip ends here.